· The role of the Cancer Patients & Carers Group. · The purpose and value of the 'Five Senses Survey', which is carried out by patients and carers in chemotherapy units. · Macmillan Cancer Information Services and developments, including the value of volunteers. You will also have the opportunity to suggest ways of improving cancer services and to socialise with staff and other patients and carers. 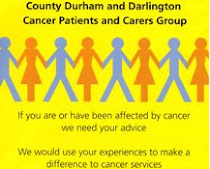 The AGM for the County Durham & Darlington Cancer Patients & Carers Group will take place from 1.30—2pm, for those interested in attending. A brief introduction about the Group being a locality group for the North of England Cancer Network (NECN), our role, the work we do and how to get involved. A talk by chemotherapy and acute oncology staff about chemotherapy services, acute oncology services and neutropenic sepsis. Time for questions at the end. An explanation about the 'Five Senses Survey' carried out by patients and carers in chemotherapy units e.g. what it involves and the value of the survey to staff and users. Macmillan Cancer Information Services staff to discuss their service, developments and the value of volunteers. Closing remarks, thanking people for attending, asking for comments on how services could be improved, reminding them about our next business meeting (Thursday 23rd May, 6.30-8.30 at Durham Rowing Club). An opportunity to socialise/discuss with professionals and other attendees.